Most homeowners, who did not have a chance to replace their leaking roofs during spring and summer want to get it done in the fall – before the cold weather arrives. August, September and October are the busiest months of the year for a roofing contractor (for us at least) we get many calls and online estimate requests from homeowners looking to install a new IB Flat Roof or a Metal Roof on their home. At least 75 percent of these inquiries mention that they would like to have a new roof installed before the winter. While we do understand your desire to have a new roof before winter weather comes, I must point out a misconception among many homeowners who believe that a roof can only be installed during the warm months. While this is partially true, due to limitations of specific roof types (technologies), for us, installing our roof systems in the winter is the same as it is in the summer – just a little colder. In fact, WINTER, is the best time for homeowners to have a new roof installed, as you will get the best roof prices, as well as a choice of the best roofing contractors. 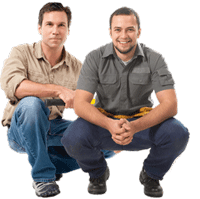 Because work is limited during the winter season, contractors compete for work and lower their prices to get the job. However, be aware that some roofs can’t or should not be installed in the winter – read on to find out what you should know about winter roofing, and which roofing materials should not be installed in the cold weather. Let’s take a look at the roofing systems which can be installed in the winter without compromising quality, and the systems that need to be installed in the warmer weather.I will divide roofing systems into two categories – flat and sloped roofs. 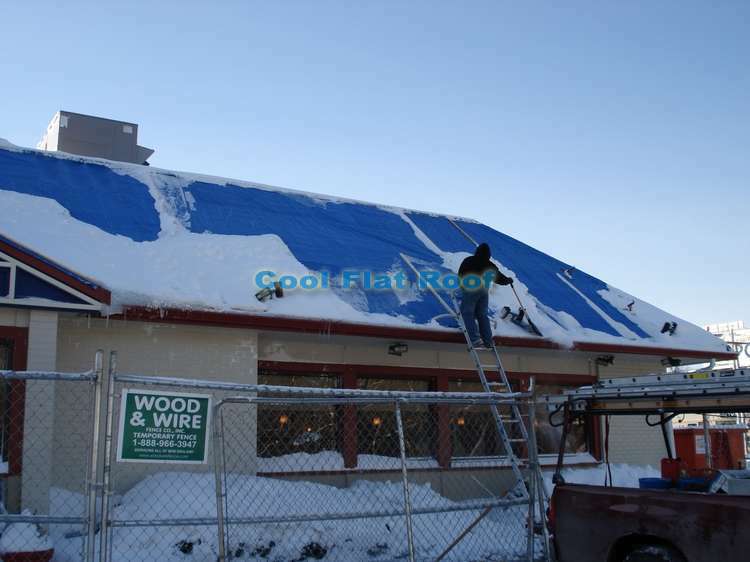 Also, lets establish that by “winter” I mean temperatures below 40 degrees F.
When it comes to flat roofing, there are only two systems that can be safely installed in the winter – PVC and TPO. 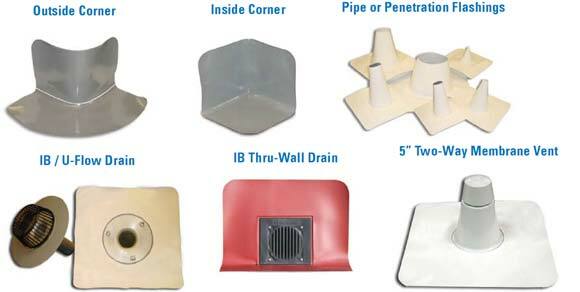 These are thermoplastic single ply flat roofing products, which are installed using Hot Air Welded seams, instead of various types of adhesives. Many homes in New England have shed dormers, which are build to use otherwise unusable space in the attic, and greatly expand square footage of the home, without huge expenses of building an addition. However, the way these shed dormers are built, requires them to have a very low sloped roof, at times almost flat. These roofs are the first to leak, as conventional roofing materials cannot stand up to the Ice Dams build up and wind driven rain water, penetrating the roof between the seams in shingles and rolled roofing products. 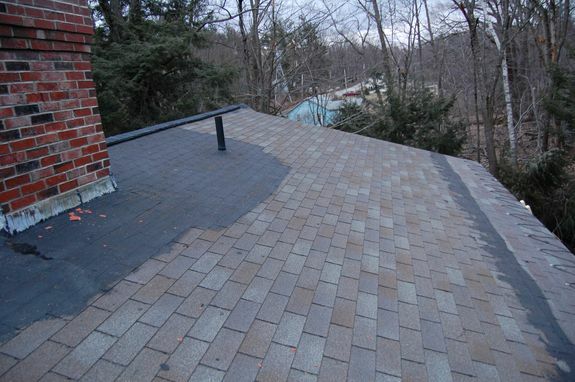 The problem with shed dormer roofs is that often asphalt shingles or rolled roofing materials are used, and the seams on such roofs are held together with adhesives – usually tar that melts under the sun’s heat and seals the seam. 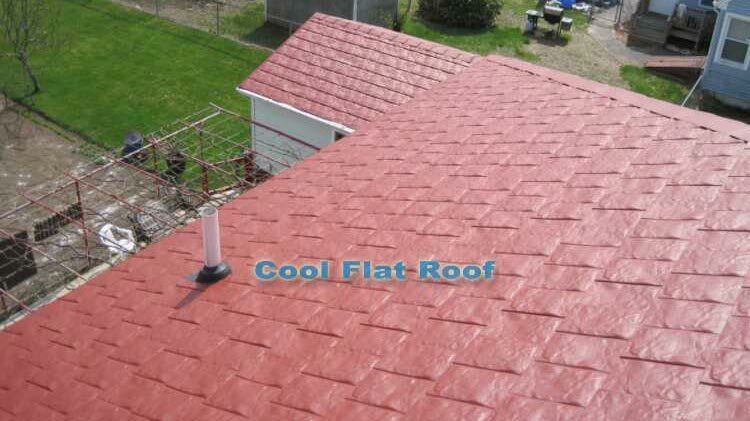 When asphalt shingle is used in such roof assembly, the joints between the shingles and the overlaps between them are an easy way for water to penetrate the roof. 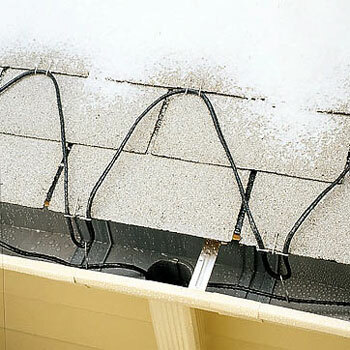 In the winter, moisture between shingles freezes, expands and breaks the seal. At this point, the roof leaks constantly, and no matter how many patch jobs you do, it will still leak. Also, a low slope on the roof greatly shortens the life of the shingles. Not to mention that when shingles are installed on a pitch of less than 3 in 12″, the warranty is immediately void on them. While many roofing contractors will try to convince you that with the use of Ice & Water shield such as Grace (considered by many to be one of the best I/W shield products), will make your roof water-tight and leaks free, real life experience shows that even on a steeper slope, such as 3 or even 4 in 12, the roof still leaks, and Ice dams leaks find their way inside your house. 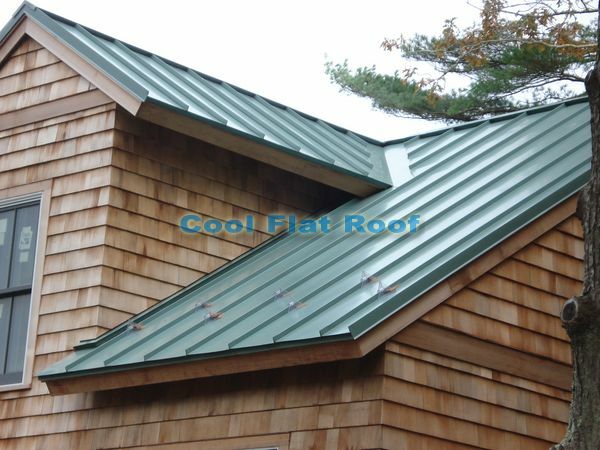 A metal roof could be used to solve the constant roof leaks and ice dams on such low slope roofs, but in this particular case (the picture above), the pitch of the roof is too low for even a standing seam metal roof to work, and the best solution in this case would be an IB Flat and Low-slope roofing membrane. Besides, standing seam would cost double of what an IB flat roof cost would be. Another solution commonly used by residential roofing contractors is the rolled asphalt roofing, or simply rolled roofing. Please keep in mind that most flat roofing systems come in rolls, but each type has it’s own trade name, such as Tar & Gravel, Rubber roofing, etc., and rolled roofing usually refers to a fiberglass membrane saturated in asphalt and asphalt, and coated with stone granules – very similar to asphalt shingles. 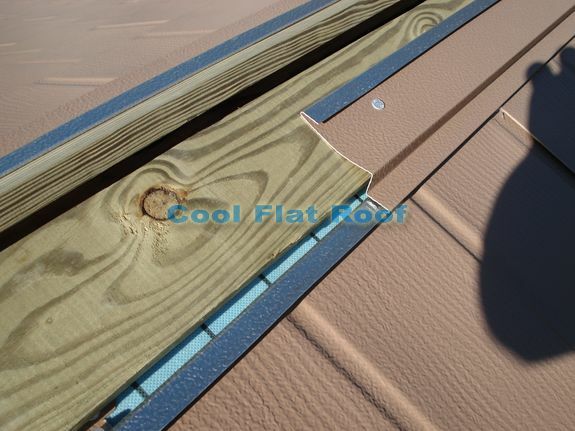 Learn more about different types of flat roofing materials. Rolled asphalt was a popular choice for DIY roofing projects and many residential roofing contractors would use it, as it was fairly easy to install and easy to buy from a local roofing warehouse, without any special training involved. 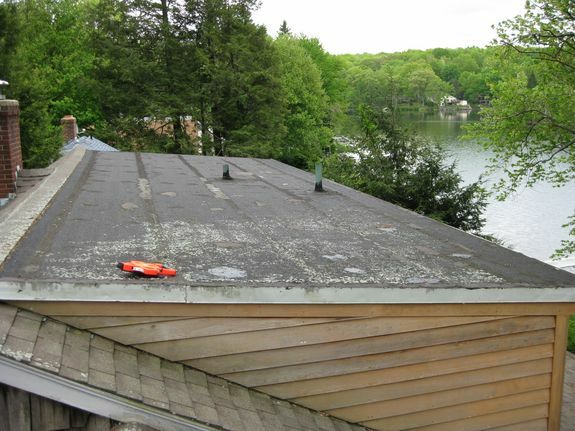 Unfortunately, these roofs only last about five years, and often begin leaking even sooner, causing expensive to repair structural damages, such as those shown in the picture below. 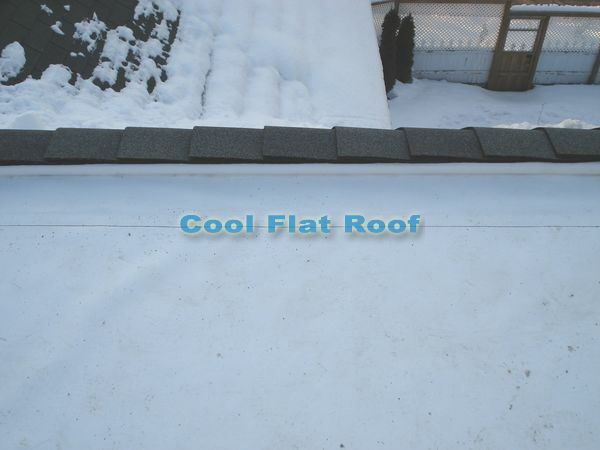 Because the seams of rolled asphalt roofing are sealed with roof cement and fastened with roofing nails right through the membrane, the condensation below and the ice above the rolled asphalt quickly break the seal and the roof begins to leak. Patching such a roof will temporarily stop the leak, but it will actually create more damages, as in the meantime you allow water more time to destroy the roof decking and rafters. We recommend that homeowners with a flat or low-slope roofs avoid the cheap alternatives which may last you 5 years, and will cost much more the next time you have to replace them, as additional repairs of rotten wood replacement and tear-off / disposal fees add on to the total price tag. Instead, choosing a lifetime IB roof system will make your roof last for decades of leaks free performance and will reduce your cooling costs, as its Cool Roof surface will reflect almost 90% of the solar heat. You will also be eligible to receive up-to $1500 tax credit for installing an Energy Star rated Cool Roof, making your final price almost the same as that of a cheap leaky alternative. 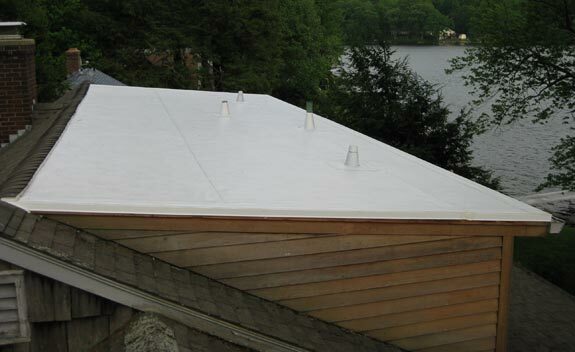 IB Roofing membrane is a fully watertight system, utilizing hot-air fusion welded seams, which insure a permanent bond between the sheets, flashing and even the drip edge. There is no glues or adhesives involved in the installation, as is the case with EPDM rubber roofs. Rubber roofs use splice tape or black glue to keep the seams together, and after just a short period of time the adhesives break down, and the roof begins to leak. IB Roof is a complete roofing system with all the components made out of PVC / CPA material, which are welded right to the membrane, ensuring permanent watertightness. There is a flashing for every possible roof penetration, such as in-roof drains, inside and outside corners, air vents, pipe boots, etc. IB Roofing membrane does not cure over time, and remains weldable even 25 years after installation. What does this mean for you? If there is ever any mechanical damage to the roof, such as falling tree branches or accidental cuts, the roof is easily fixed by just welding a patch to the damaged area. No need for special cleaners or glue. Just wipe the dust off and weld. As an additional benefit to the environment and to your wallet, an IB roof will outlast 2, 3 or even more conventional roofs, which would otherwise have to be dumped in a landfill. 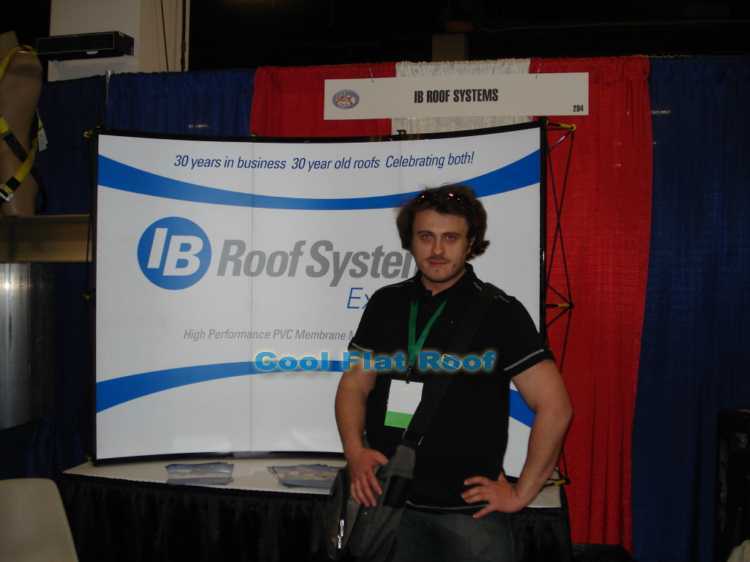 As a certified IB Roof Systems Installer, we can install and IB roof for you in any part of Massachusetts, Connecticut & Rhode Island, as well as in southern ME, NH and VT. 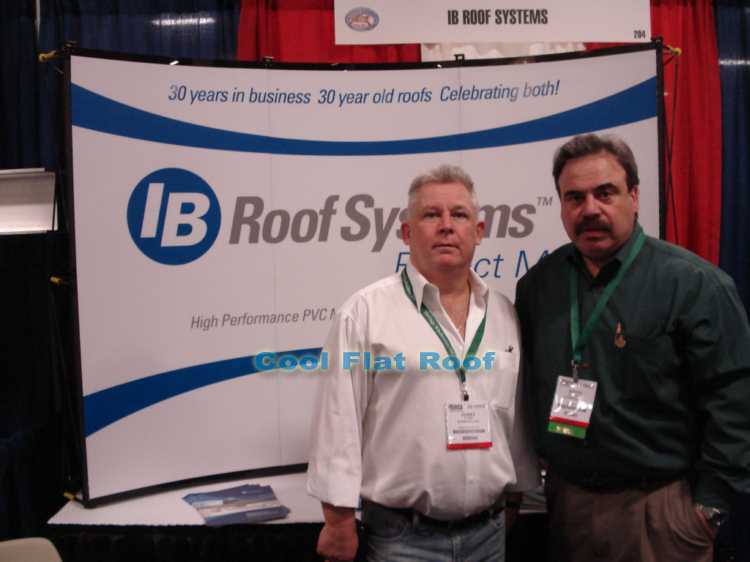 Schedule your flat roofing inspection / estimate today. It is no secret that a metal roof, although designed to last a lifetime, is only as good as its installers. Additionally, metal roofing is a completely different animal than asphalt shingle roofs, cedar shake or even slate roofing, and to be able to install a metal roof correctly, you need a professionally trained metal roof mechanic. Usually when a metal roof is installed by a seasoned roofer, who never worked with at least one of many types of metal roofing, the results are more than sad. The roof begins to leak with the first rain, the roofer’s reputation suffers and a very unhappy customer seeks to resolve the problems with the manufacturer, and files complaints with BBB, Angie’s List and other consumer protection organizations. 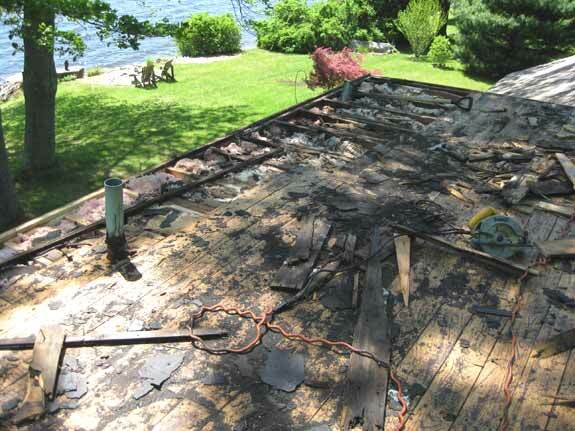 Fortunately, all of these troubles can be avoided if a professional metal roofer is hired to do the job. We understand the needs of home and business owners, and their demand for the highest quality of materials and installation. We hand pick the best materials and the most thoroughly thought-out roofing systems, and combine them with our unique installation methods, which in the end, provide you with a true lifetime roofing solution, and unmatched beauty for your home. In the above video clip, you can see how we approach the installation of this residential metal roof in Revere, MA. As with most roofs, attic ventilation is crucial to the longevity of the roof, its wooden substrate and the health of the entire home, including its occupants. There are multiple ways to ventilate the attic space, but the most effective way is to utilize a ridge and soffit ventilation system, where the cold air enters the attic through the soffit vents, located along the eaves of the roof and escapes through the ridge vent. 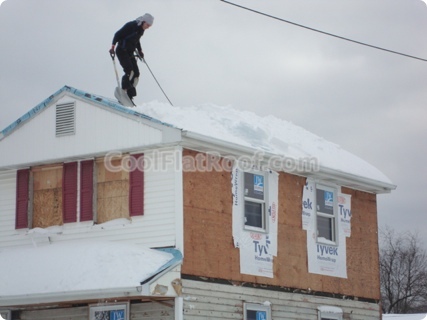 However, the ridge vent is often the path through which the wind driven water can penetrate the roof, causing slow, but devastating damages to the roof’s framing. 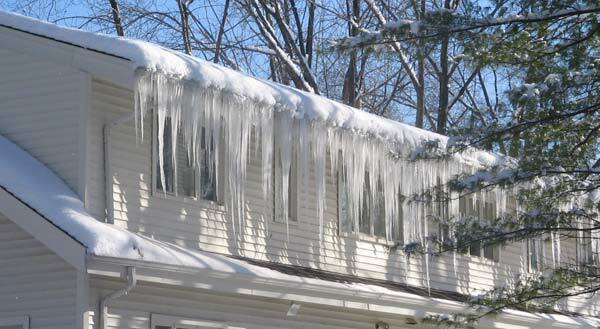 Since the amount of water coming through the ridge vent is usually insignificant, homeowners will not notice the leak for many years, at which point the damage has already been done, and repairs can cost thousands of dollars. It is very common that the wooden substrate is completely rotten along the ridge line, and so are the tips of the rafters merging at the peak of the roof. We designed a special way to raise the ridge vent off the roof level by 3/4 of an inch. While insignificant in terms of aesthetics, this bump-out prevents the wind driven water to enter the ridge vent cut-out, while the ventilation still works just as efficiently as it would have otherwise. Notice, that the custom flashing we use rests on top of a pressure treated 1×4 board. 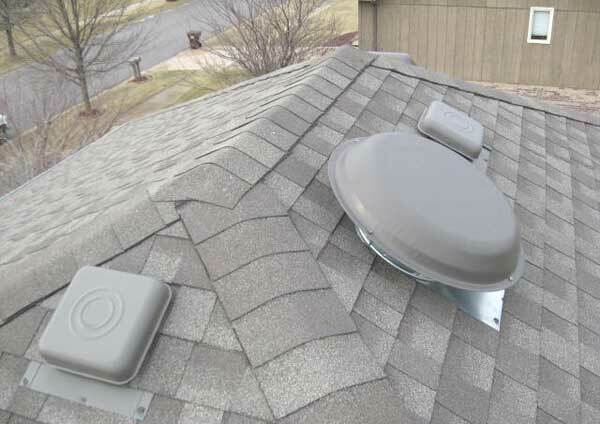 The flashing is inserted into the top lock of the last course of aluminum shingles, which makes it impossible for wind driven water to penetrate the roof. Just as an extra protection measure, we use commercial grade exterior caulking at the joins of top locks between every shingle.